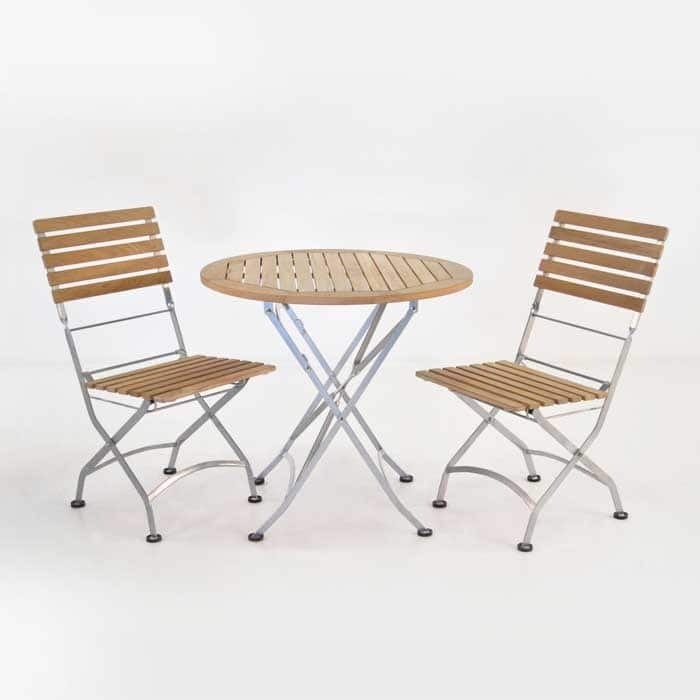 The perfect brunch or morning coffee folding teak dining set; the Cafe Round Folding Table and Side Chair Collection contributes to an intimate, attractive and refreshing area for easy dining. Powder coated steel and Grade A Teak create a durable and comfortable structure whilst contrasting exquisitely! The pieces are inspired by European culture, so you can envisage yourself in your own little Parisian corner. This folding teak dining set features a simple and elegant design. 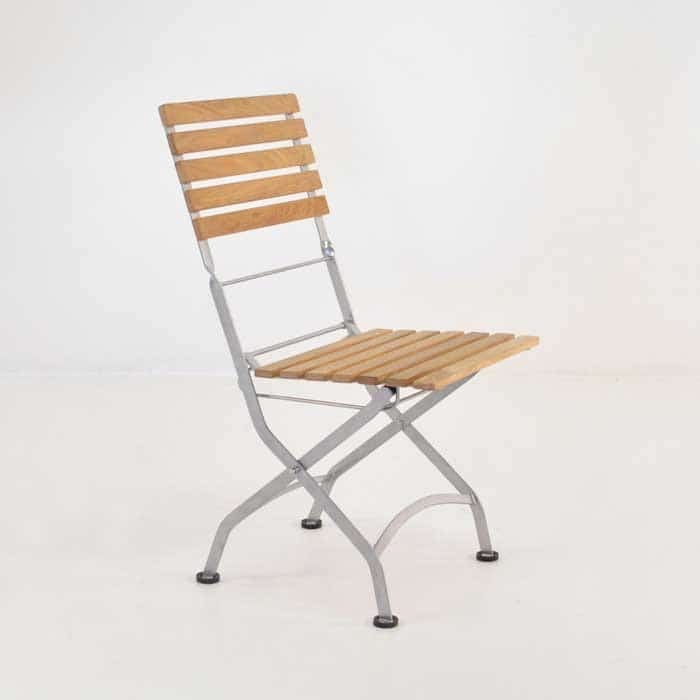 While the chair and table tops are beautiful slats of Grade A Teak; the structure is ornate powder coated steel which easily folds away giving you options for traveling picnics or creating more space when needed. 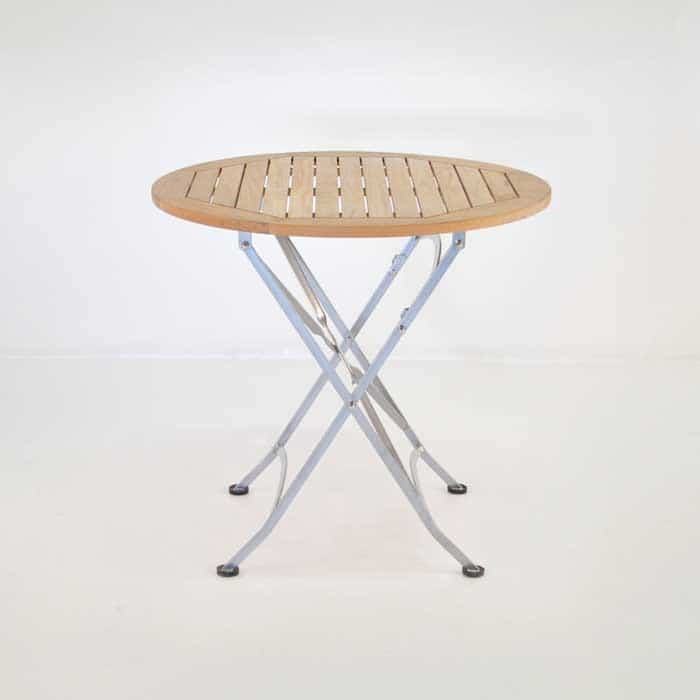 Our Cafe Round Folding Table and Side Chair Collection is another set from Design Warehouse that offers many different options for outdoor dining. This tasteful collection is a fantastic choice for your cafe or restaurants courtyard… imagine these under the shade of your Sunbrella® umbrella surrounded by greenery. Your guests will embrace the romantic attitude of these chairs and table. At Design Warehouse, our focus is quality, which is why we choose the best marine grade products to suit the dramatic weather conditions of New Zealand and the wider pacific. This particular folding teak dining set features Grade A Teak which has a high density of rubber / oil content, meaning that it sports a beautiful grain and honey glow, is incredibly strong so that even when the wood patinas to a pretty silver colour, the furniture remains long lasting and will withstand the elements. As well as this amazing wood that features in so many of our product lines; we also carry Raw Concrete, Batyline® mesh, #316 Stainless Steel and Sunbrella® fabric products. These pieces can be bought separately, so why not try the folding chairs with one of our Concrete dining tables? Blend materials to create the look you desire, whether modern or traditional, we have you covered! Design Warehouse carries the largest range of outdoor furniture in New Zealand, we organise delivery all over the country from our warehouse in Auckland to your home or business. Call us now to talk to one of our sales associates to put together the best package to suit your home. 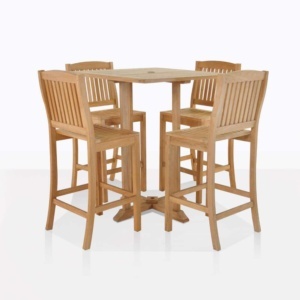 Our Cafe Round Folding Table and Side Chairs Collection also sports a rectangular table and arm chairs. Both sets of tables and chairs fold away neatly for storage. Acquire for your balcony or garden today! You will adore these gorgeous pieces of outdoor furniture in your home.